Lt DeWall had been upgraded from CoPilot to Pilot on 2 January 1944. The 1Lt Hershel R. DeWall "Make up" crew, formed for mission #106, 6 February 1944, was dissolved following mission #115, 2 March 1944, when Lt DeWall completed his combat mission tour. Crewmen then completed their missions with other crews. The following crewmen were substitutes for the crewmen named below the crew photo: 1Lt James B. Noland (N) - mission #106, T/Sgt Louis H. Breitenbach (Eng) - mission #106, T/Sgt Walter G. Francis (Rad) - Mission #106. S/Sgt Elmer L. Peterson (Tog) - missions #112 & 113, S/Sgt Jack E. Green (Eng)(POW)- missions #113 & 114. 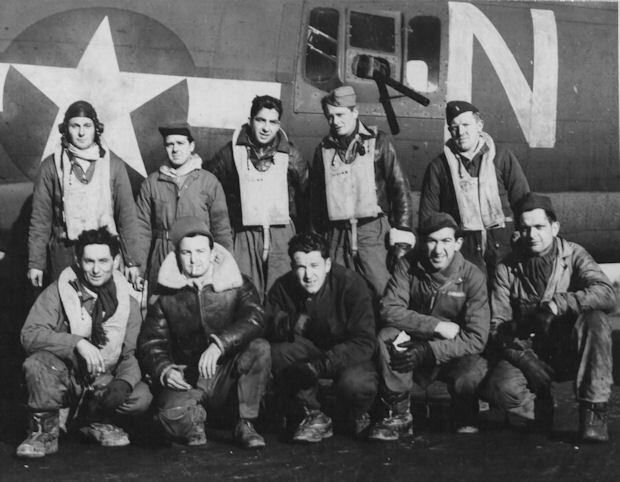 (POW) Five of the crewmen who had flown with Lt DeWall crew became POWs after being hit by ME-109s on Mission #119, 8 March 1944 to Erkner, Germany in B-17G #42-31471 Doolittle's Destroyers (360BS) PU-E. 1Lt Leo B. McGrath, Pilot; 2Lt John M. Chapman, Jr.(CP); S/Sgt Jack E. Green (Eng), S/Sgt Harry V. Hosso (RWG) and S/Sgt Charles J. Bonn (Rad). S/Sgt Bonn parachuted with a badly injured leg and was placed in a inadequate hospital with a brutal German Doctor who wanted to amputate his leg. He persuaded a more friendly French Doctor to treat and save his leg. Following recuperation he was sent to Stalag 17.